Qwest is pitching its new data backup service with visions of what might happen without it. Qwest's new ad campaign attempts to show Wall Street that it's not just a landline phone company. Toyota's new ad for its third-generation Prius shows a planet in harmony, with humanized clouds, fields and flowers bursting into song. AT&T's upcoming ad campaign spotlights its smart-phone market position. Video courtesy of AT&T. Catherine Zeta-Jones returns as T-Mobile's pitchwoman in the wireless carrier's new "Mobile Makeover" campaign. Video courtesy T-Mobile. A new ad for Papa John's Pizza turns a pizza box into a hologram with the help of a web cam. Video courtesy Papa John's Pizza. The Economist launched an ad in movie theaters in the U.K. for the first time in seven years. Check it out below and remember to comment! So..the other day I was asked to take a look at the FedEx logo and asked whether or not I noticed anything particular about it. I took a look and eventually after a few minutes I gave up and was like ok what do you see that I don't? I was shocked at what I saw and so I decided to see if I could find any other companies that do something similar. If you don't know what's in the FedEx logo, take a look at the 7 logos below and see if you notice anything in particular! If you still can't figure it out, take a look at the link at the bottom of the post and your answers are revealed! 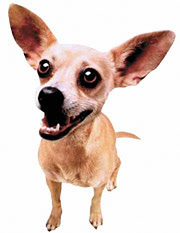 Gidget, one of the famous Taco Bell chihuahaus died from a stroke at the age of 15. The Taco Bell dog made its first appearance in June 1997 in a campaign created by Omnicom Group's TBWA/Chiat/Day of Playa del Ray, Calif. The first dog was actually Dinky, and the character was portrayed as a male who uttered a line that would quickly become a pop-culture catchphrase: "Yo quiero Taco Bell." Though the dog made Taco Bell cool again, it was not without its problems. Throughout its run, the dog was the target of criticism from Hispanic groups, who accused the Yum Brands unit of trafficking in stereotypes. And in June 2003, a federal jury ordered Taco Bell to pay $30.2 million (plus another $11 million in interest) to two men who accused the restaurant company of stealing their idea for a marketing mascot and icon. I'm sure the drug hoopla is still not quite out of the picture yet but it looks like Michael Phelps is gaining some trust back by partnering with Subway. Though the commercial was done in a very typical Michael Phelps style which pretty much requires him not to say anything besides nod and smile...such an awkward looking kid. In other news...doesn't it look like Jared the Subway spokesperson is gaining some weight? haha... I don't know...it looks it! This is video of a billboard in New Zealand that bleeds when it rains. It's pretty terrifying, but according to the ad agency, there hasn't been a fatality since. Dunkin..probably my favorite coffee around, perfect taste..perfect look and best donuts in town. I was excited when I saw a new Dunkin spot airing in South Korea where few people have a morning coffee habit. Let's see if it works...after watching the commercial and using Pump It from the Black Eyed Peas, they really want to portray Dunkin as the morning pick me up. Start your day off alert...have a Dunkin! Orrr what's your take, drop me a comment and share your thoughts! In memory of the King of Pop watch a 1984 Pepsi ad, which features a boy who unexpectedly encounters his idol Michael Jackson while imitating his dancing. I can't believe an ad like this even worked back then! What I did find interesting though is that Pepsi has continued it's same advertising message since 1984....something along the lines of creating a new generation and creating a new fresh outlook on life. I would love to write more but after the flight I am feeling pretty jet lagged which inevitably causes a lack of motivation to do any kind of writing. On Friday, July 3, 2009, the Economist launched an ad in movie theaters in the U.K. for the first time in seven years. Check it out and leave a comment telling everyone what you thought! Poolside! enjoying the sun!, originally uploaded by westlingk. Enjoying a huge portion of ice cream! Enjoying a huge portion of ice cream!, originally uploaded by westlingk.